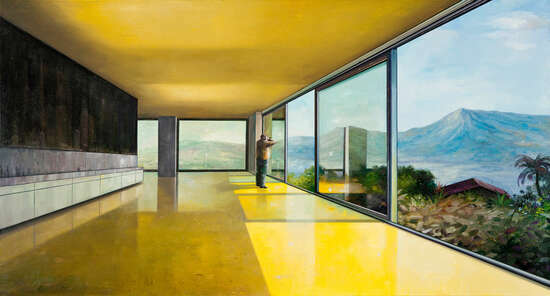 The painter Jens Hausmann grew up in Meiningen and studied under Professor Ralf Kerbach, a renowned objective realist artist, at the University of Dresden. 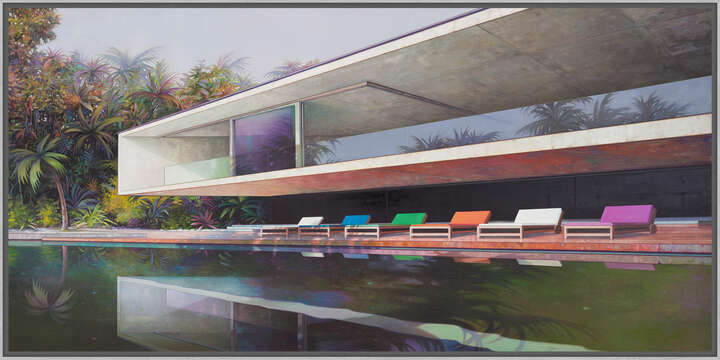 His latest, energy-charged works combine his approach to modern architecture with an artistic fascination for space, landscape, and perspective. 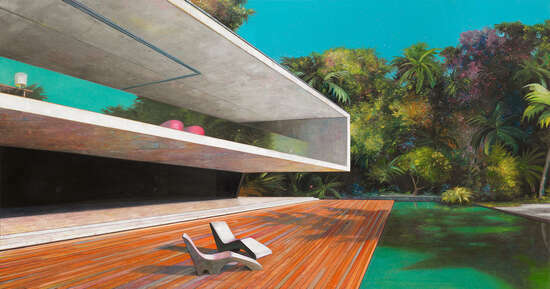 The modern houses he “constructs”, surrounded by fantastically coloured landscapes, are like dream homes. The images combine a colourful, intensive aesthetic with popular magazine and advertising images. Together with a soft, almost hot sunlight, this gives the scenes a southern air. 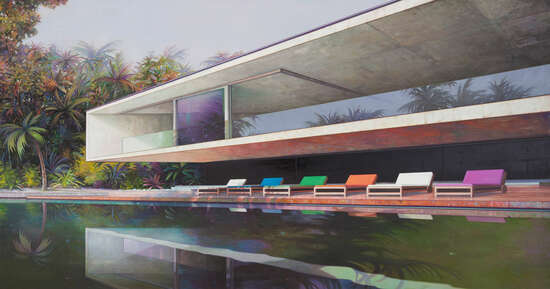 He is particularly interested in the elaborate reproduction of distant worlds, such as the continent of South America, and especially the modernist buildings of Brazil. They are scenarios of artistically idealistic projects for future metropolises, formed in part on the drawing boards of architects like Oscar Niemeyer. 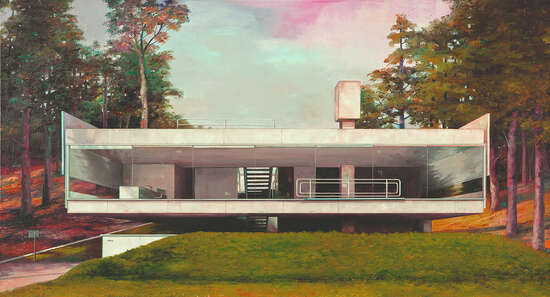 Here, painting meets the lucid observation of architectural rationalism. 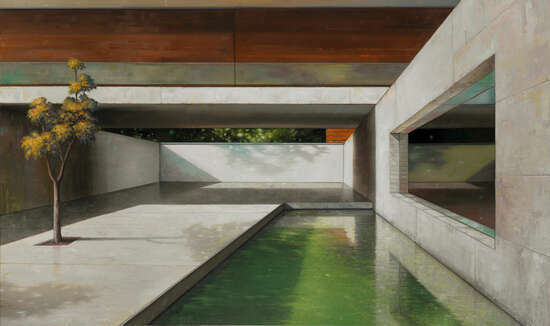 It distinguishes itself through the realistic depiction of materials such as concrete and the broad, reflective glass surfaces with their views in from, and out to, the surrounding landscape. The carefully measured “architectural quadrature” is preserved in freely floating terraces, parking areas, and driveways, and also in the gardens with their generous swimming pools, and the surrounding vegetation. The metal window frames are clearly marked, serving to frame our vision and celebrating the view out and the reflections within, both from near and far. 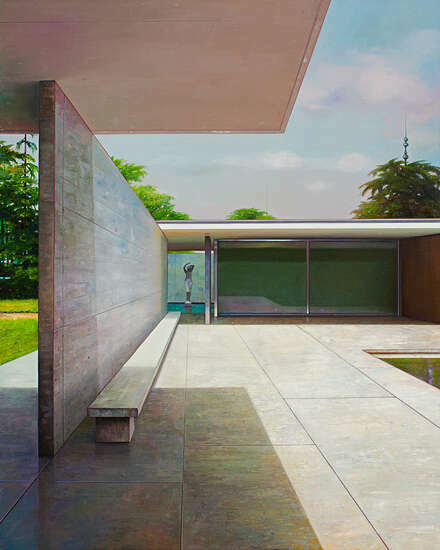 The scenery in front of the building is replicated and reproduced: not only in the suspended windows and doors that reach to the floor, but also in the large water surfaces in the garden. The inhabitants are rarely visible. 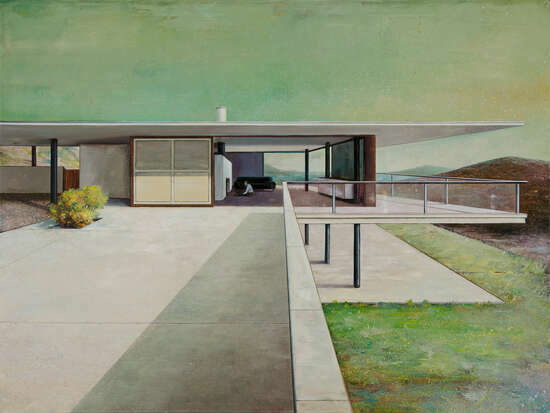 Though they are missing from these dream homes of modern architectural heritage, they leave behind status symbols and traces of an exalted existence. Objects such as reclining chairs or cars, designed to the last detail, seem to have a character between décor and tested certainty. The comfort of the home is clearly missing, however. Though we feel invited, as if we are visitors, we also feel voyeuristic. 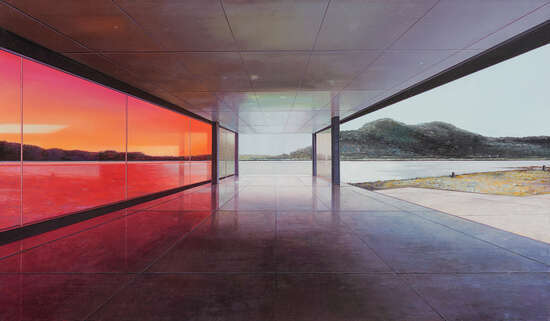 Jens Hausmann opens to the viewer what is usually hidden from view by tall boundaries. He lets us live out our curiosity for the unknown, or simply revel in memories, experiences, and mini adventures. 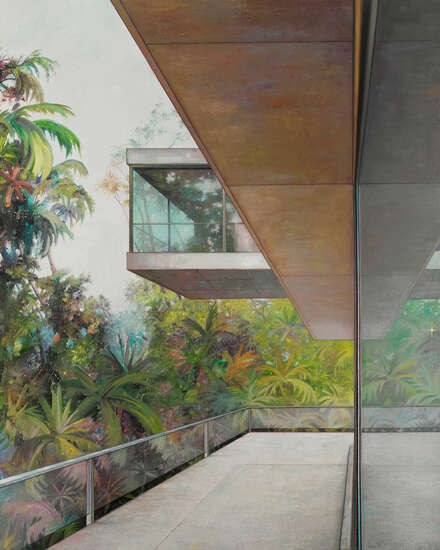 Above all, the excessive colours produce a kaleidoscope of nature that conquers and takes possession of parts of the architecture just as it does to the viewer’s gaze. The reality and authenticity of these images is striking: They let us feel the warm light and smell the garden air, yet also allow us to travel to a new world. We are visiting a scene of post-modernism that lets us become witnesses to a multi-layered globalisation. Continually changing and adapting, the house is on the one hand static, on the other it is marked by the clash of new perspectives and image spaces. 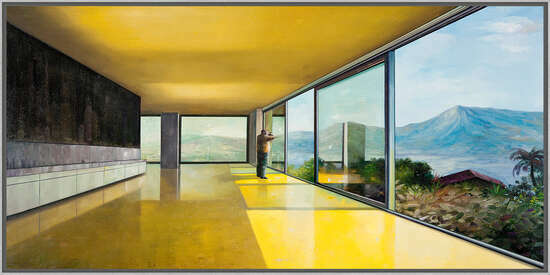 The relationship between presence and absence alone ensures a visit full of longing and the emergence of new visions.